If you happen to own a hotel, restaurant or villa at a destination where tourism has dramatically dropped, then you might want to talk with Mr. Ajit M. George, co-founder of the very successful Winemakers Dinners in the British Virgin Islands. Mr. George is a seasoned fundraiser and entrepreneur who knows how to raise money and draw a crowd. 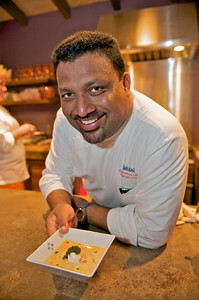 In 1989, Ajit became the Founding Chairman of Meals On Wheels Delaware and launched the highly successful Meals From The Masters Culinary Weekend in 1998. During the ten years that he chaired these major culinary events, he was able to raise more than $4.2 million for Meals On Wheels in Delaware. Ironically, 27 years ago, Mr. George bought a little 147-acre property in the British Virgin Islands called Nail Bay. In 2008, he was trying to figure out how he could increase tourism to the BVI, while raising money for the local charities that desperately needed funding. Learning from his success with Meals on Wheels, he decided to see if his magic could work in the Caribbean. Could he entice travelers to his piece of heaven by offering an event that brought together culinary stars and legendary winemakers while supporting local BVI charities? He was not sure, but was willing to find out. 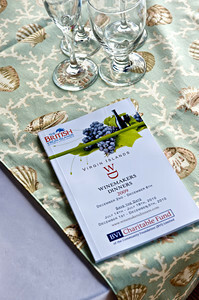 So, with the help of a few friends, The BVI Winemakers Dinners idea was born. Now, all he needed was a few famous chefs, international winemakers and the hospitality of villa owners throughout the 60-plus BVI archipelagos to support his dream. Martin Dindos, owner of OHMS, a company that imports premium wines from Germany and fine champagnes met with Ajit in the Czech Republic and together they conspired to make Winemakers Dinners a reality. 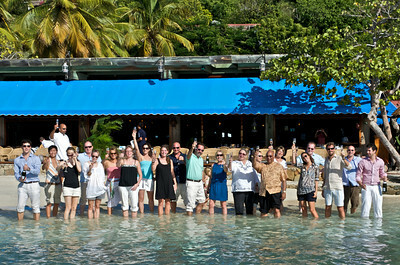 Mr. Dindos, a founding sponsor, helped convince many of the winemakers to donate rare and exclusive wines for the event, as well as fly to British Virgin Islands for the dinners. Richard Grosche, wine journalist from German wine magazine Weinwelt and Manager of the international wine academy MUNDUS vini donated his time to meticulously pair the wines with the food each day. OHMS – which stands for On Her Majesty Services – also donated the fine Czech porcelain and glasses for the seven course place settings each evening. This past Winemakers Dinners series, held on December 2 to December 6, welcomed international tastemakers, seasoned gourmands, travelers and media from Canada, Czech Republic, France, Germany, India, Italy, Japan, Korea, Puerto Rico, Slovakia, United Kingdom and the United States. The gourmet lunches and dinners were held at a collection of exclusive villas and restaurants on three islands and featured an incredible variety of cuisine prepared by some of the world’s most celebrated chefs. 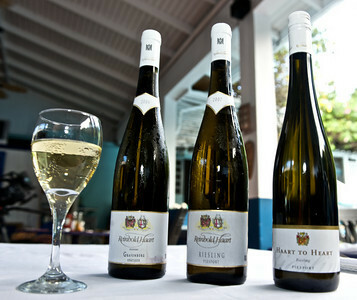 The wines were poured by winemakers from Argentina, California, France, Germany and Italy. Over 860 people attended the four dinners, seven luncheons and the VIP Reception. 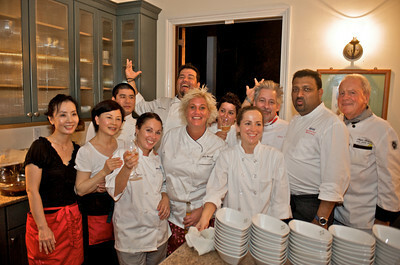 The four-day event featured 74 courses of food, and 81 different wines that were paired with these courses. This series of Winemakers Dinners kicked off with a private VIP Reception at the Pirate’s Bight, on Norman Island and featured over 12 different Caribbean dishes prepared by Chef Matthew Webb from Guana Island and Norman Island. Two different wines from Rosemount from Caribbean Cellars and two burgundies from Domaine Bouchard Pere et Fils from Grands Vins de France were poured. 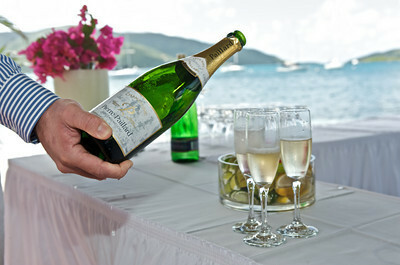 The first dinner was held at Baraka Point Estate at Nail Bay, Virgin Gorda. 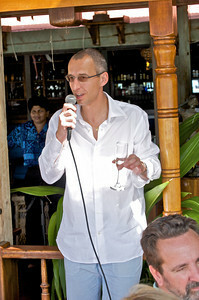 The second night was hosted by Richard Friedman at his private villa, Frenchman’s Lookout on Tortola Island. 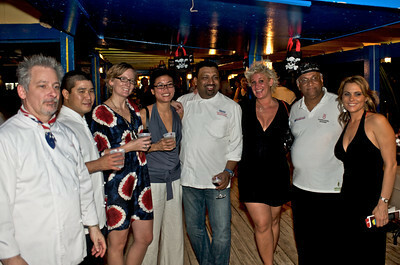 The third dinner was hosted at Giorgio’s Table and Rock Cafe on Virgin Gorda. 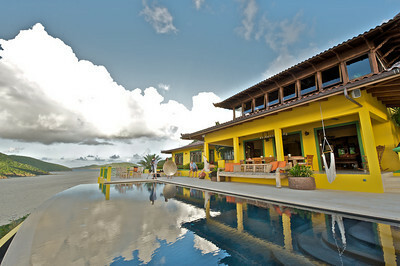 The final dinner was hosted at the newly-constructed Golden Pavilion Villa on Tortola Island. 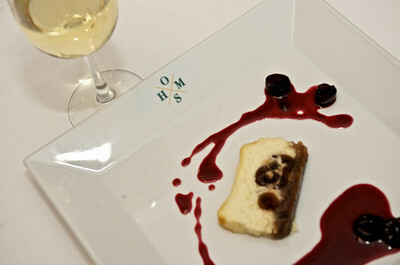 Each night, the seven-course dinners were paired with 14 renowned wines, personally poured by the vintners. Every night, the guests were treated to a pre-dinner sunset reception featuring Grand Cru Champagnes from Pierre Paillard Champagne in France. Visiting chefs and culinary personalities created a symphony of food under the leadership of Vikram Garg from Halekulani Resort in Waikiki, Hawaii who has served as the Executive Chef of the Virgin Islands Winemakers Dinners from its inception. Albert Kramer who served as the first Executive Chef of Virgin Gorda’s Little Dix Bay when it opened in 1964. Virgin Gorda based chefs who participated included Heidi Davis Benyair, pastry chef at Biras Creek and Giorgio Paradiso, owner of Giorgio’s Table All the chefs volunteered their time and talent. Gerhard Grans from Weingut Grans-Fassian in Leiwen, Germany. All the winemakers donated their wines for this incredible fund raising event. “The 2009 Winemakers Dinners were a series of exclusive events during which guests had the opportunity to meet some of the most gifted winemakers in the world and sample their award-winning wines. These are wines were expertly paired with innovative creations by international master chefs together with some chefs in the British Virgin Islands. We are pleased that over $110,000 in gross revenue was raised from the 2009 Winemakers Dinners even though the economic climate was very challenging. 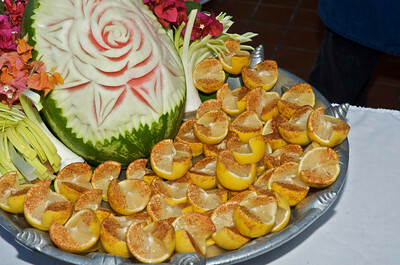 However the combination of great food and wonderful wine served in unique settings in the British Virgin Islands persuaded both visitors and residents to support this event,” said Mr. George. 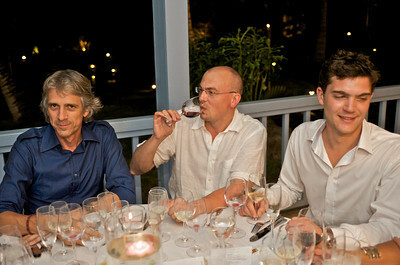 The four beneficiaries of the net proceeds of the 2009 Winemakers Dinners are The BVI Red Cross, St. Mary’s School, Virgin Gorda, St. George’s School, Tortola, and YEP (Youth Empowerment Project) in the East End, Tortola. The Co-Chairs of the BVI Charitable Fund are the Premier of the British Virgin Islands, the Hon. 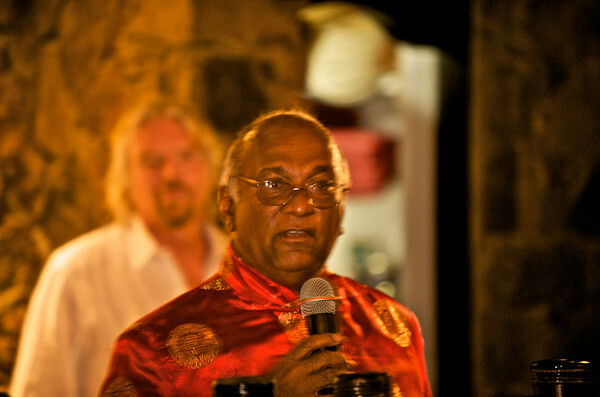 Ralph T. O’Neal, OBE and Ajit Mathew George, Managing Director, Nail Bay Resort. 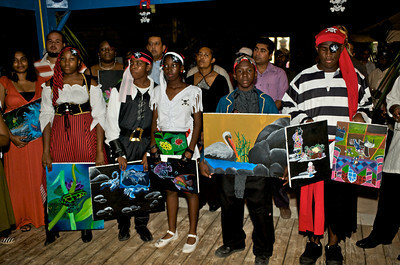 The BVI Charitable Fund was established in March 2008 with a $25,000 challenge grant from Nail Bay Resort to help promote this destination to potential new visitors while at the same time creating new and innovative fund-raising events to benefit various charities in the BVI by attracting support from both outside and within the BVI. The BVI Charitable Fund is part of the Community Foundation (BVI) Limited which has no paid staff or overhead. In addition to Nail Bay Resort the other Founding Sponsors are Allivictus and OHMS. 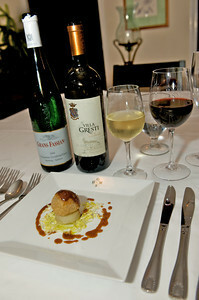 For additional information including pictures from the various dinners and lunches visit www.winemakersdinners.com. The next Winemakers Series will be July 2010.